Okay, LOTRO fashion blogosphere, help me out a little here. The bright and happy pattern on Golodir’s Mantle was once also found on the Bree-land reputation rewards vendor, as a reward for Kindred. Wasn’t it? 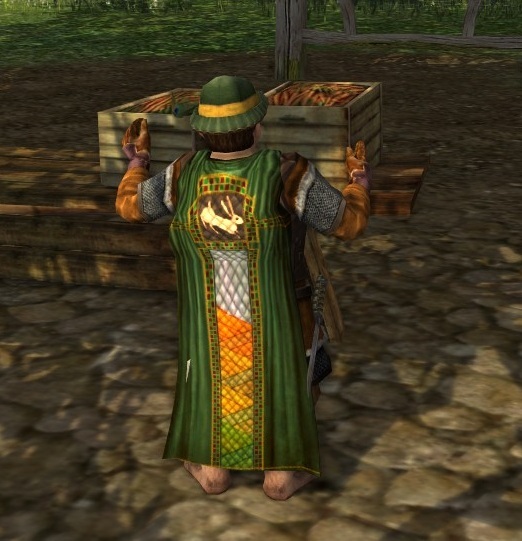 (EDIT: Thanks, Cosmetic Lotro, for updating me — Tad Leafcutter can also give you this cloak, just outside the Bree-town Hunting Lodge). (Outdated paragraph, go!) In any event, it isn’t now — so forgive me, readers, for picking another cloak that is slightly difficult to acquire. I only say “slightly” because Volume I, while easily solo-able, is also an endless slog of inspiration buffs and horse travel. And great LOTRO-lore, don’t get me wrong, but I still think “slog” is accurate. That said, some of the armour offered as quest rewards in Vol. I is just gorgeous, and often appears nowhere else in game. Golodir’s Mantle is a reward from Vol. I, Book 14, Chapter 1. You’re up in Angmar for this. The sky looks bloody and torn. The landscape is a jagged nightmare, and as you travel to claim the breastplate of Laerdan, you pass through raging beasts and foul, stinking waters. And then you get a cloak with a bunny on it. 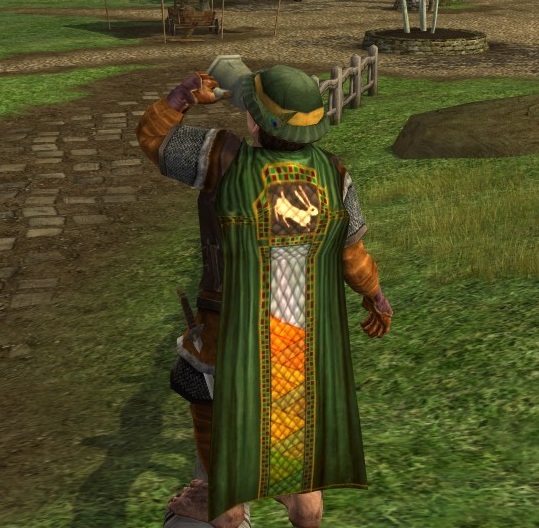 It doesn’t even dye, which totally contradicts a comment I left this morning on Cosmetic Lotro about the new Rohan armour. But this cloak is just so lovely, so cheery and Hobbity and Bree-ish, so not epic…I can’t help but love it. Haha, I know! The writer in me wants to believe that Golodir gives you this cloak as a small, poignant reminder of landscapes and wildlife left behind. Angmar might be horrific, but somewhere there are bunnies and green fields. But mostly, I giggle because…bunny. He’s standing outside the lodge. …seriously? Argh, I checked this morning, and didn’t see it. On a Kindred char, no less. Ai, well, this is why you rule. And it really does call for Hobbit-kind, doesn’t it? Not uncouth at all! And I’m enjoying how all the diagonals work together in that outfit! One of Beacher’s old outfits was built around this cloak. I had a lot of fun trying to find items to match that beautiful gradient on the back!